Confederate States of America. 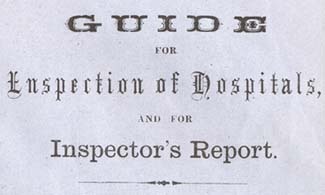 Surgeon-General's Office Guide for Inspection of Hospitals and for Inspector's Report. Guide for Inspection of Hospitals and for Inspector's Report. [Richmond? : s.n., between 1861 and 1865]. Confederate States of America. Army -- Medical care. Hospitals -- Inspection -- Confederate States of America. Military hospitals -- Confederate States of America -- History.